You’ll never see an ad on TV for graphic design services. Same goes for video production services. So why are we being bombarded with online and TV ads for website design services? This might cause you to think that website production is easy. So easy in fact that any monkey in the world can whip them out. These companies have developed automated templates that call center-like employees fill in with information about a business. There is nothing wrong with this approach if you need to get online with a web presence in a pinch. Problems can arise in multiple forms, however. How are they about making changes to your site? How will you be paying for this? One time fee? Free up front, but $100 per month? Who takes care of actually promoting your page so it can be found? Actually there are dozens of problems that can occur. Trust us, there are dozens. After nearly 20 years, McQuillen Creative Group is the source of great websites from Aberdeen, SD. 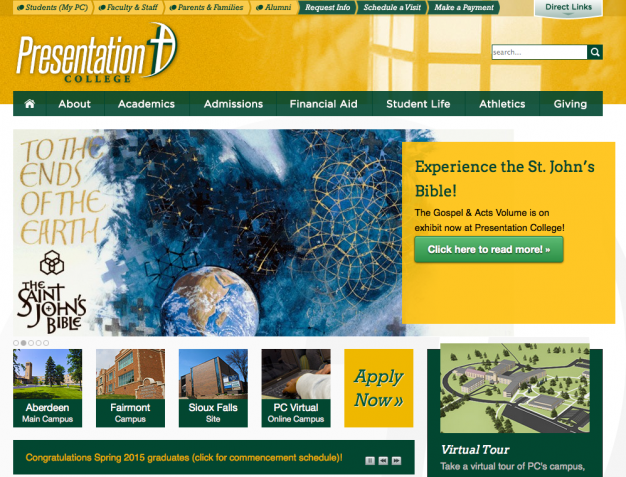 Presentation College’s website features a “one-click” master menu allowing a user to get to anywhere in the site easily. The mobile version automatically reverts to a different, icon-based navigation system. This project took about nine months to plan and execute. We also designed the new logo. See More. The real question you should be asking yourself is how a website fits into your overall marketing strategy? That dictates how your site is designed, what sort of content you’ll include and how much. Do you require different functionality on mobile devices than computers or laptops? Do you want Google to find you? Not only are there dozens of problems that can arise from hiring a web developer from a “website farm,” there are dozens of considerations that need to go into your site, as you may have imagined. We get many people calling us asking for a “price for a website.” And that’s all they say. Unfortunately, that is an impossible question to answer. A home builder would never provide a construction quote without a blue print. Even still, someone needs to design that blue print. In other words, there is a lot that can go into a website, no matter how simple it seems, and every thing affects the price. As a result of maximum efficiency, this website for Quest Aviation only includes exactly what an approaching pilot wants to know, up front, right on the home page. No need to show swanky bathrooms, big airplanes, or tile floors. 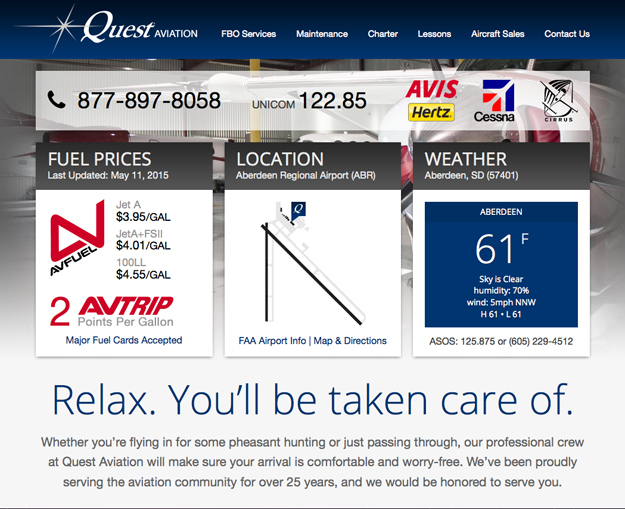 Quest wanted pilots to pull up to their FBO, get gas, relax a bit, and take off again. The site does include all the amenities, services and aircraft for sale you’d find at a FBO, but again, that wasn’t the focus of this home page. And it’s especially designed for mobile use. See more. McQuillen Creative Group has been creating websites in Aberdeen since 2001. We currently have about 50 websites under management. We’ve done complicated websites for $40,000 and we’ve done very simple sites for $1,500. We can create a website for any budget, but the realty is, with the added complication of mobile friendly devices, we won’t do a website for less than $3,000. Why so much you say? You have other quotes for far less, what’s the difference? As mentioned above, you can get a website for a monthly fee, and no up front cost. The bottom line is, as with anything, you get what you pay for. And if you’ve already been through this process with another provider and they are not responsive about updates, you need to give us a call. It’s a big deal when a new hospitality brand emerges on the scene. The folks at The Rivett Group asked McQuillen Creative to develop the logo for a new brand they were launching called My Place Extended Stay Hotel. This is the same group that launched the Super 8 over 40 years ago. Needless to say, they knew what they wanted and they know what works. We also helped them develop the name, but My Place ultimately came from them. 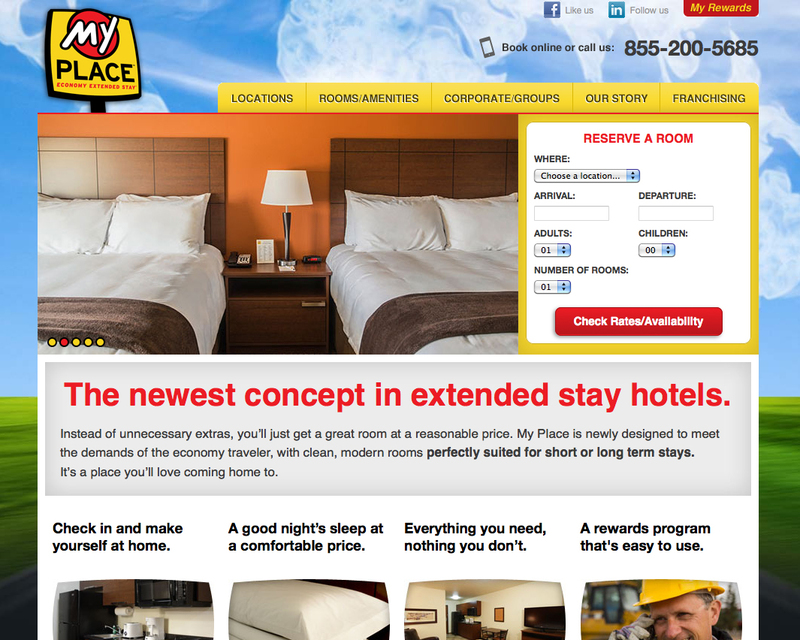 Of course a new hotel brand needs a robust website and the one we designed for them, shown here, will soon be replaced by a much more robust site that will accommodate their rapid growth all across the U.S. See more. No matter the price, our process is always the same. By the time we figure out your estimate, we’ve already determined what it is you need. Yes, we breakdown everything about your site even in the proposal phase. That way you can see exactly what you’re going to get and how it fits your marketing strategies. If you approve our estimate, we create a “blue print” of how your site will be arranged. Then you either provide us the content written to fit our plan, or we write it for you. We can take photos for your site, or make videos to create longer engagement for users. When the plan is approved and the content is collected, we begin the design phase. Design brings together the creative look with the content and images or video. The next time you see your site you’ll see it mostly complete. You’ll have a chance to review every aspect about it, then we move onto getting it online. At that point we’ll train you on making updates yourself. Another great website from Aberdeen SD. 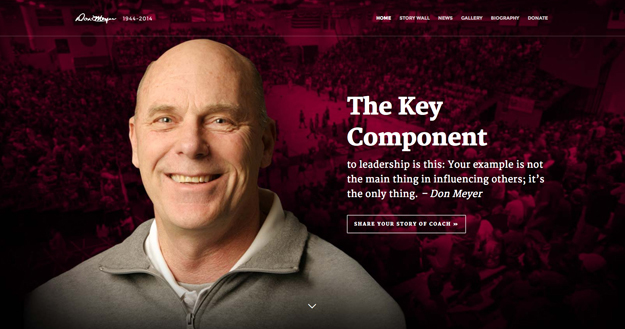 When famed basketball coach Don Meyer passed away, McQuillen Creative Group was entrusted with creating a tribute website to honor the career of this sports legend. Our greatest suggestion was to provide a way for people to leave comments about their experiences with Coach Meyer. Northern State University came to use with the challenge of getting the website designed and functional by the time of his funeral, which became a national event here in Aberdeen, South Dakota. We host nearly all of our websites for clients. We have three separate hosting packages, and most pick the mid-level plan that includes one hour of service per month and 10% off any additional web work we do on the site. It’s important to mention that we don’t outsource overseas or across the state. All our websites are from Aberdeen, South Dakota, designed and programmed. Most importantly, we can offer an additional “online visibility package.” For one flat fee we’ll register your business and website with all the major search engines and review websites. This greatly helps in getting you found when people search for you. You can do this step on your own, but it takes a fair amount of work, and each search engine has a different process. After you’re up and running we can discuss “search engine optimization,” or SEO, for short, with you. The biggest misconception about websites and searches is that as soon as a site goes live, Google will find it, simply by typing the name into a search window. More and more, this simply isn’t the case. It takes weeks for your site to appear “organically.” Google likes websites that are busy, well liked and frequented often. A new site simply can’t compete. While we do a fine job with outside links, key word optimization, and tags, Google holds all the cards. We strongly recommend a strategy utilizing paid ads on a variety of online platforms. After a logo design for the Gold Dust Casino and The Hotel, McQuillen Creative Group was challenged with also designing a website for this recently reborn casino in South Dakota’s historic city of Deadwood. MCG was also retained to manage the search engine optimization so that the casino and hotel would gain higher ranking in Google searches. After a few months of strategic SEO work, Gold Dust shows up high on the first page of anyone looking for hotels in Deadwood. 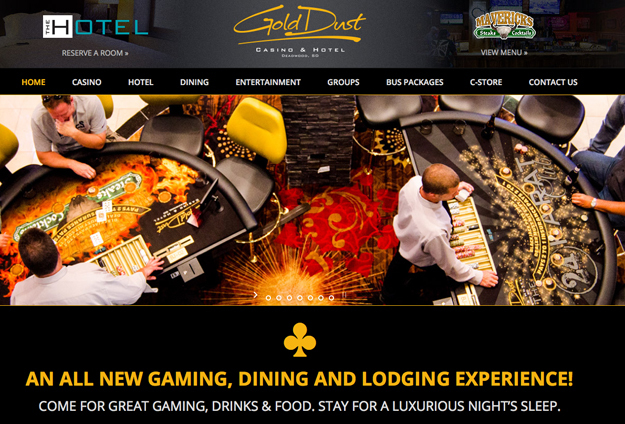 Gold Dust Casino and Hotel’s website was designed entirely in Aberdeen, South Dakota. And that’s how it works. There is no magic bullet, no SEO promises, no quick solution. You may experience many websites that appear to be so simple in their look and design, that you think they cost nothing to develop. The reality is, they are probably very complicated and what you’re seeing is the result of months of testing and refining. Simple is best, but effectiveness is paramount. So feel free to shop around. Bring us your quotes, we’ll point out the differences in them all and recommend a perfect solution, even though it may not be with us. We know the questions to ask, and how much the answers will honestly cost. Call 605-226-3481 or email. Read more about mobile friendly websites and what Google thinks of them. Hint: you need a mobile friendly website!